and see what all the talk is about. Now you can take CARE Services with you anywhere! Just scan the code above using any smartphone QR Reader, and you'll be instantly taken to the mobile version of our site. 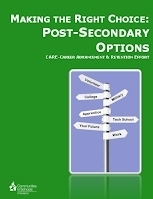 Deciding what to do after high school is a challenge for any student. The choices are many—continuing education, getting vocational training, finding a job, or juggling part-time work and classes. It’s also at this time that many young people first think about moving away from home. You probably already know that the amount of education you have can broaden or limit your career options. It can determine whether you can find employment, the type of careers available to you, your chance of finding a career you enjoy, and how much money you earn. esteem, more meaningful employment, and economic self-sufficiency. comfortable life as an adult. Unsure what career is right for you?